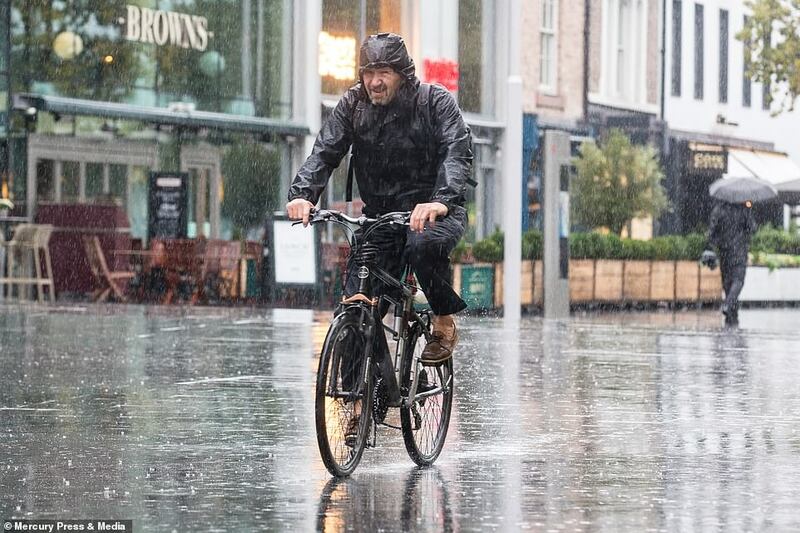 Blustery winds and heavy rain caused disruption across parts of Britain again today after Storm Bronagh blew in overnight with gusts of up to 78mph, with further severe conditions expected on Sunday. 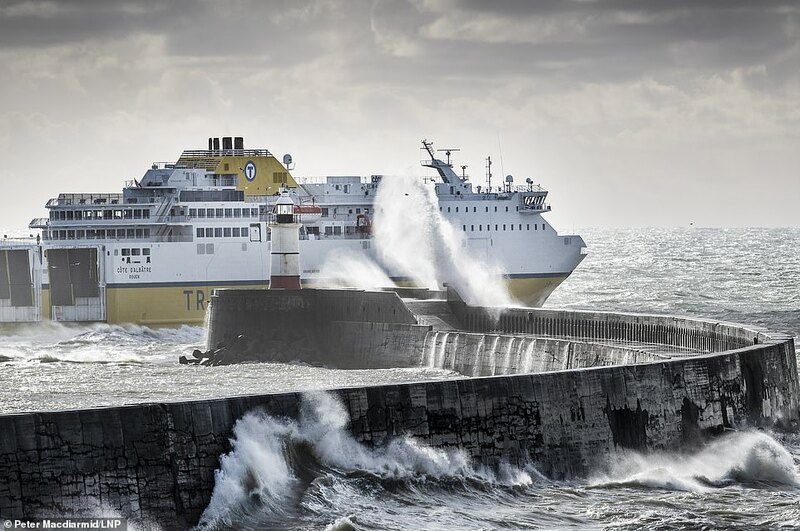 Coming hot on the heels of Storm Ali, the second named storm of the year threatens to cause more travel misery in England and Wales with fallen trees and flooding blocking roads and rail routes. The Met Office issued a wind warning from 11am to 6pm today, saying strong winds are expected to develop towards the Liverpool Bay area - and there could also be hail, heavy rain and thunderstorms. 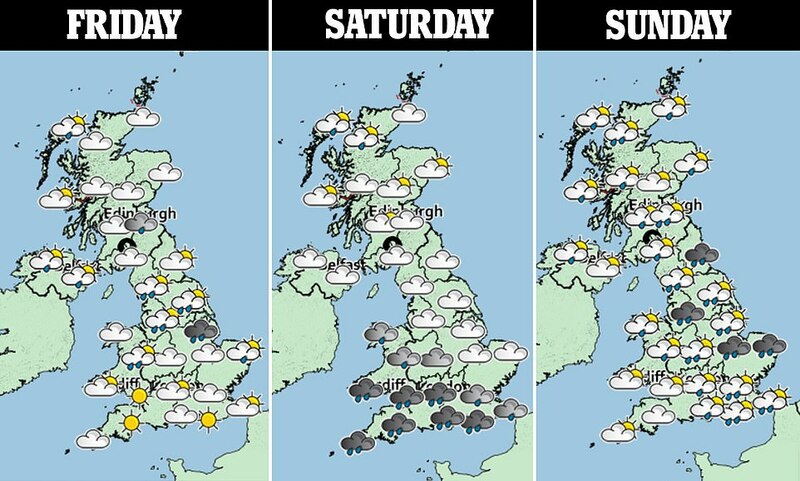 Tomorrow may provide brief respite, but Sunday is expected to bring more severe weather - with the Met Office issuing warnings for up to 2in (50mm) of rain, fierce winds and flooding across much of England and Wales. Bronagh brought heavy rain as it swept across the country a day after two people were killed in Ali. 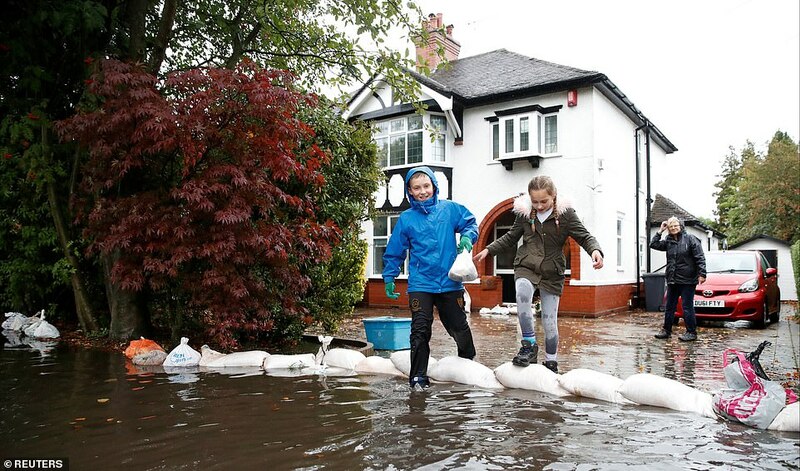 More than half a month's rain fell in Sennybridge in South Wales, and Sheffield saw nearly half a month's rain fall in 24 hours. 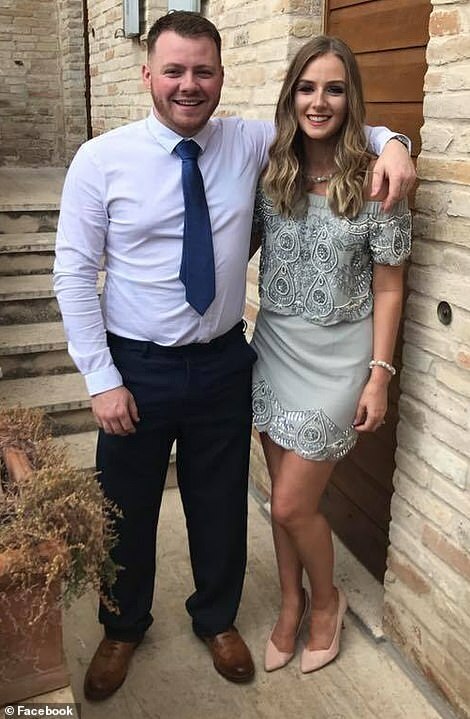 It came as the fiancée of Robert Matthew Campbell, 24, who was killed by a falling tree during Ali in Co Armagh, said the couple had been due to collect their wedding rings last night - but she will now place his in his coffin. Mr Campbell was one of two people who died in Storm Ali on Wednesday, with the other being mother-of-three Elvira Ferrari, 56, who died when her caravan was blown down a ledge to the seashore in Co Galway.Speed restrictions are in place for many trains across the network in England and Wales due to high winds, which are forecast to reach between 45 and 50mph across much of the country, with isolated gusts of 60mph possible. More than 15,000 properties were without power across Newcastle-upon-Tyne and its surrounding areas this morning, with supplier Northern Powergrid blaming 'an unexpected problem with the cables or equipment'. Commuters in Wales face some of the most severe delays, after Bronagh caused flooding on the lines between Machynlleth and Aberystwyth, and near Mountain Ash. A landslip in the Dinas Rhondda area blocked the railway line between Ystrad Rhondda and Porth, and a fallen tree near Carmarthen also resulted in disruption. 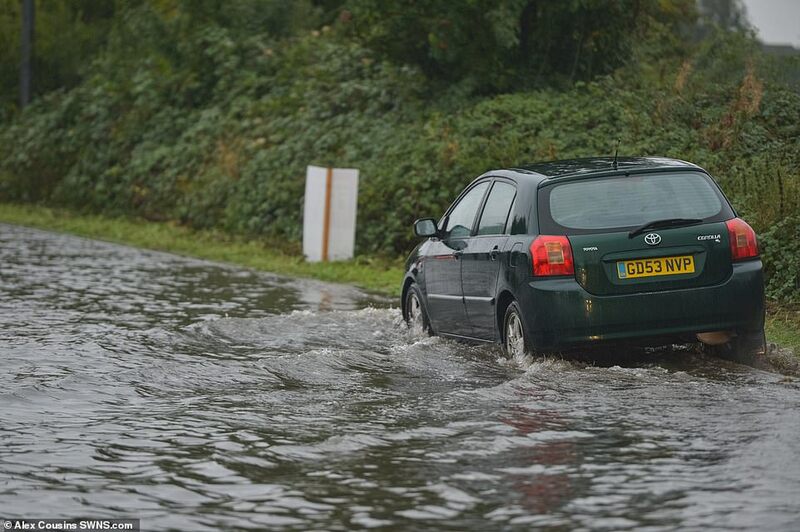 A car was spotted by police in Llandovery, Carmarthenshire, floating down a river after storms brought torrential rain. The 4x4 was seen bobbing in the river as water levels rose during Storm Bronagh. Passing police captured the car turned makeshift boat on camera. Nobody was in the vehicle at the time. Dyfed-Powys Police tweeted: "Several calls received today due to the incredible weather conditions. Including this report of a car floating down a river in Cynghordy. Travellers in England are also experiencing problems, particularly in the southern regions. 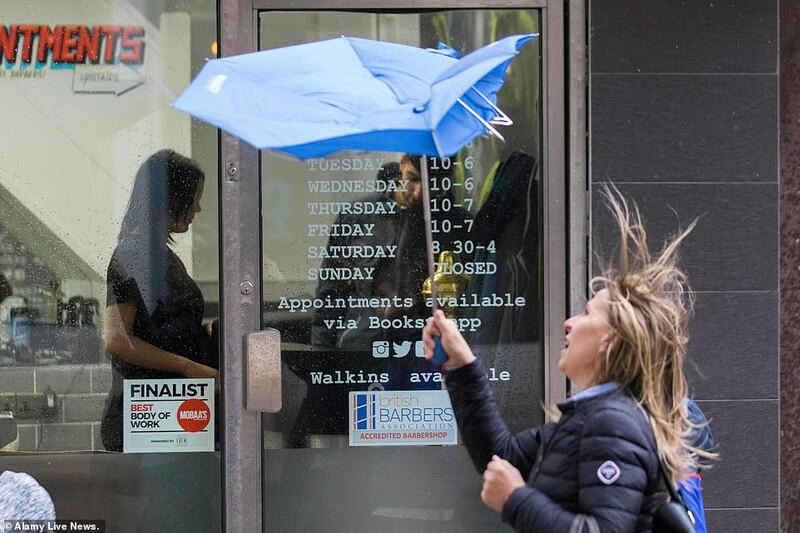 Thousands of Britons took to social media to complain of sleepless nights as the gale-force winds of Storm Bronagh wrecked havoc across the country outside. 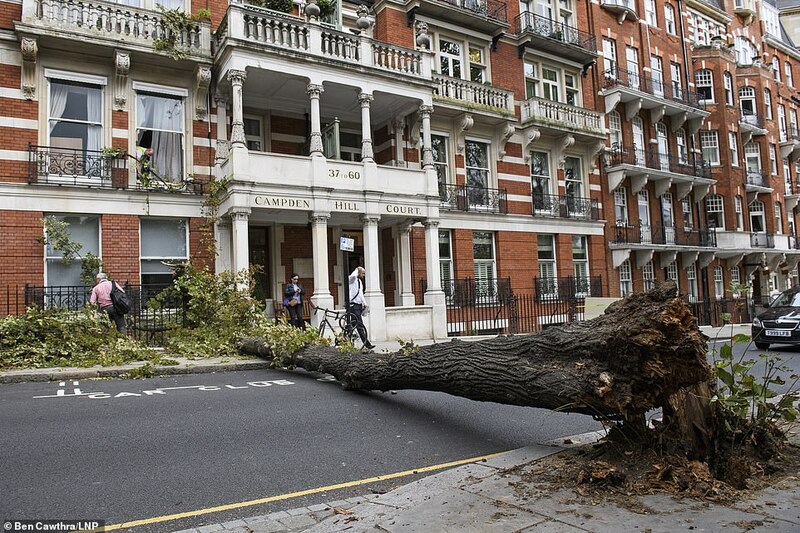 Gales reaching in excess of 75mph battered many parts of Britain overnight, with shaking windows and car alarms ensuring that millions struggled to catch 40 winks. Some users complained of dogs barking through the night while in extreme cases others were woken in the night by falling trees. User @phatnats aptly summed up her evening as 'sleep 0 - 1 Bronagh', echoing the sentiments of thousands of others on Twitter. Jen Foster added: 'No sleep for us tonight. Storm Bronagh has very much hit us, one tree already down. I dread to think what damage we will wake up to in the morning.' Some Southeastern services are delayed following a train hitting a tree at Maidstone East early this morning, and services in the South West are operating with delays on a number of routes thanks to fallen trees and the enforced speed restrictions. What does today's Met Office wind warning say? These winds will be accompanied by heavy showers and thunderstorms. Gusts of 45-50 mph are expected quite widely with isolated gusts of 55-60 mph possible near the heaviest showers. Hail is also likely. Winds will ease from the west through the afternoon. 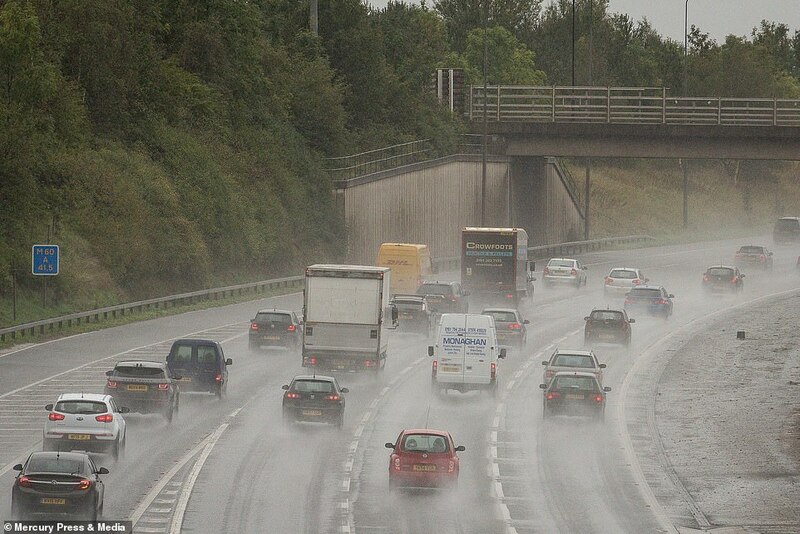 The Met Office has warned motorists to be aware of the poor weather conditions. 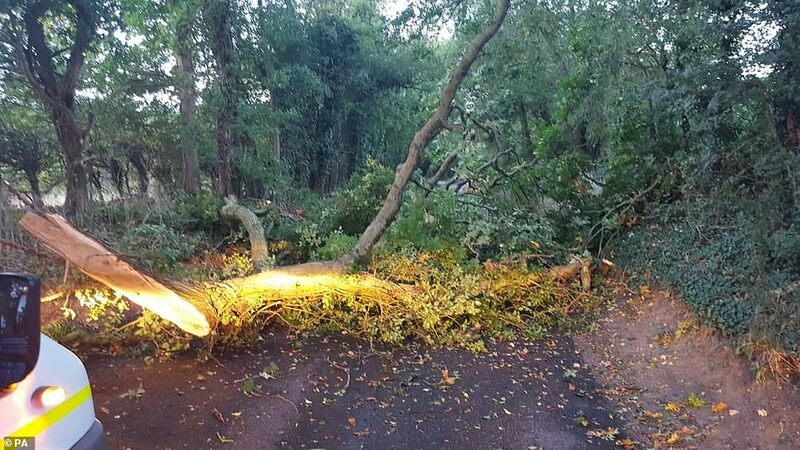 Somerset Council Highways reported dealing with 22 fallen trees overnight, and Suffolk Highways told Twitter followers they were dealing with a tree on the road near Hemingstone. The A1 near Gonerby Moor in Lincolnshire was closed this morning as recovery crews removed a lorry that had left the carriageway, while flooding on the M6 at Crewe forced a slip road to be closed for several hours. A Met Office yellow warning for wind covering England and Wales is in place until 9am today. Overnight a gust of 78mph was recorded at the Needles on the Isle of Wight, while winds could reach up to 60mph during the day today, particularly on the north-west coast of England. In South West Wales there were 12 flood warnings in place this morning, with nearly 40 flood alerts issued across the country, while there were individual warnings in place in Staffordshire, Chesterfield and South Yorkshire, with more than 30 alerts across the north of England and West Midlands. 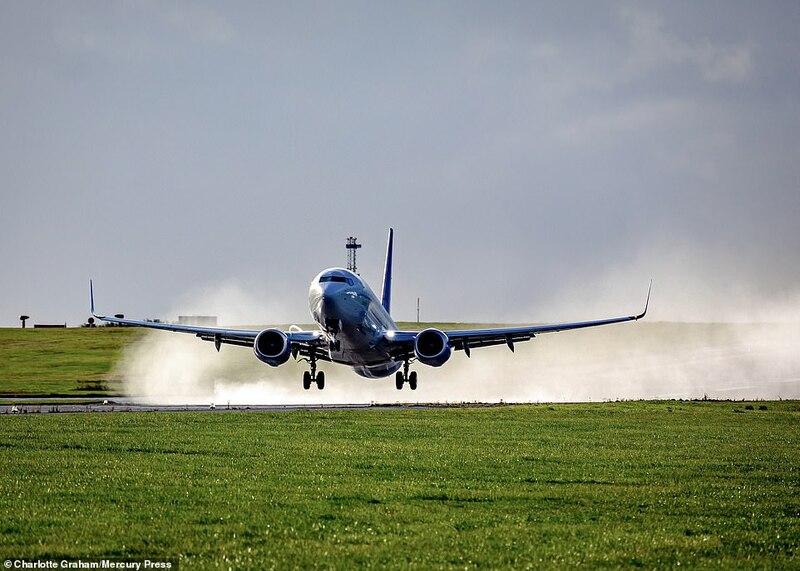 Met Office forecaster Rachael West said: 'Storm Bronagh is moving towards the North and East and we are going to continue to see strong, blustery and gusty north-westerly winds. Meanwhile thousands of Britons took to social media in the early hours to complain of struggling with a sleepless night, as the gale-force winds wrecked havoc across the country outside. Twitter user Christianna said the winds had been 'hellish' on the south coast of England overnight. It comes as the remarkable moment a civilian carries an elderly lady to safety from her flooded car was caught on camera. The man, named as Richard Hamshaw, can be seen in the clip dragging the woman out of the window of her car and carrying her to safety of drier land. A motorist had a miracle escape after avoiding injury when a huge tree fell on his car during Storm Bronagh. Dramatic pictures show how close the lucky driver came to having his vehicle completely crushed by the giant tree which came down in high winds at 2am today. Fire crews who attended the scene in Trowell, Nottinghamshire, told the man to 'buy a lottery' ticket after he escaped without a scratch. The motorist managed to free himself from his Range Rover which was completely covered by branches and leaves and was said to be shaken but uninjured. 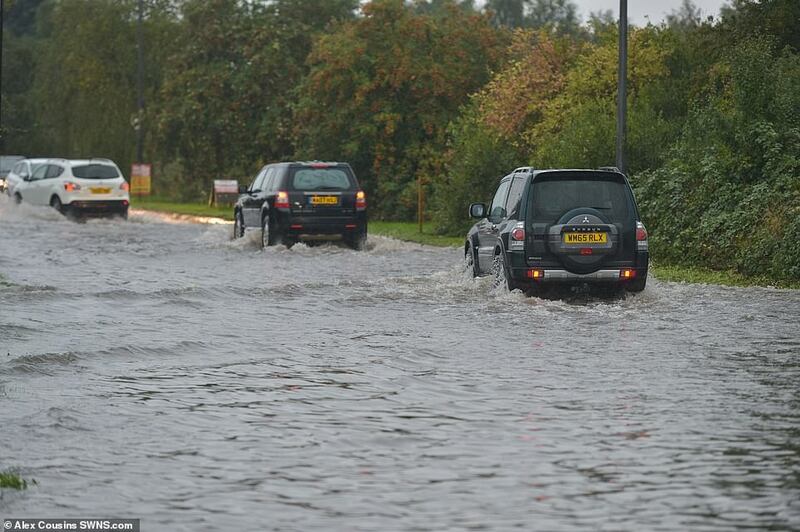 Vehicles in Scunthorpe, North Lincolnshire, were photographed struggling to get through the flooded road on Thursday evening as the horrendous weather gripped the country. Highways England's head of road safety Richard Leonard said: 'We're encouraging drivers to check the latest weather and travel conditions before setting off on journeys. 'If you do intend to travel, then plan your journey and take extra care, allowing more time for your journey. 'In high winds, there's a particular risk to lorries, caravans and motorbikes so we'd advise drivers of these vehicles to slow down. Commuters have been told to check their journeys before travelling as speed restrictions have been implemented along certain routes. 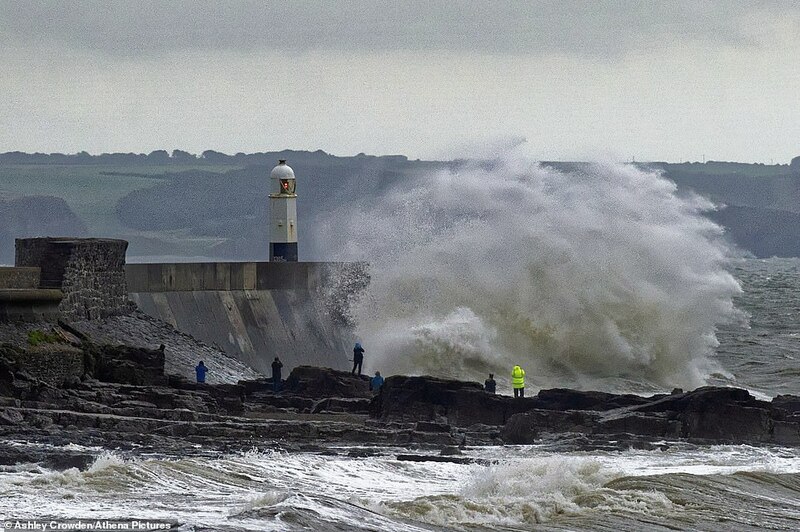 Today's poor weather comes after a Swiss woman who died in a freak accident when her caravan was blown down a ledge to the seashore during Storm Ali on Wednesday was identified as a mother-of-three who was visiting the area. Elvira Ferrari, 56, had only arrived the previous day in Connemara, County Galway, when she got caught up in the violent storm which hit early yesterday morning bringing with it gusts of 102mph. The tourist was one of two people to die in Storm Ali. Robert Matthew Campbell, 24, died after he was hit by the tree at Slieve Gullion Forest Park in County Armagh during strong winds that hit Northern Ireland. And his fiancée Robyn Newberry, 23, told today how she will now place her husband-to-be's ring in his coffin following his death on Wednesday. A new roof was blown off a building and swept more than 200 yards down the street during Storm Bronagh. The enormous structure ripped off the top of a three-storey block of cliff-top flats in the Southbourne area of Bournemouth, Dorset, at around 11.45 last night. It flew through the air and landed on the driveway of a house where it buried a blue Volkswagen Polo car parked there. No one was injured during the alarm. Stewart Britton, who lives opposite the scene said the new had only been fitted five weeks ago. He said: 'I was in bed and heard a huge bang from outside in the street. 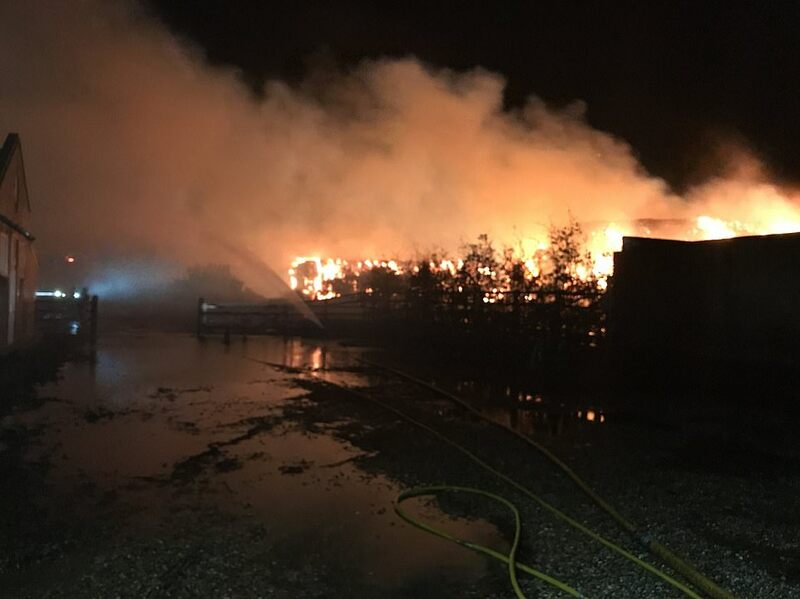 A spokesman for Dorset Police, which attended along with firefighters, said: 'We were called to Southbourne to reports of weather damage at a property. Miss Newberry told the Irish Independent : 'I first realised that something was wrong when I tried to ring Matt around lunchtime and it kept going to the answering machine, which wasn't like him. I tried calling him six times and there was no answer. Mr Campbell, from Belfast, was working on behalf of Northern Ireland Water at the time of the incident, while a colleague in his 40s was also injured in the tree fall. The men were working for Lagan Construction Limited, on behalf of Northern Ireland Water, when the incident occurred. A spokesperson for the firm said: 'We are deeply saddened to confirm that one of our employees has passed away as a result of their injuries and that another employee has been seriously injured and is currently being treated in hospital. Sara Venning, the chief excutive of Northern Ireland Water, expressed the company's deepest sympathies to Mr Campbell's family. Mr Campbell's former school, the Royal Belfast Academical Institute, have dedicated an award for 'outstanding attendence' in his honour following his death. Also on Wednesday, a primary school pupil was rushed to hospital after being hit by a tree branch during Storm Ali while enjoying his lunch break in the playground. The incident happened at Trinity Primary School in Edinburgh, at 1pm. A cordon was erected in the playground while investigations were carried out. In Claddaghduff, it is understood that Ms Ferrari had only arrived in Connemara the previous day when she rented a bike. She then went to Clifden Eco Beach Camping and Caravan Park and rented a caravan. Emergency services rushed to the scene at about 7.45am when the occupants of a mobile home on the site - popular with tourists on the Wild Atlantic Way - spotted the caravan being whisked towards the sea. The caravan in which Ms Ferrari was sleeping was dislodged from its moorings, although a tent nearby was undisturbed by the storm. 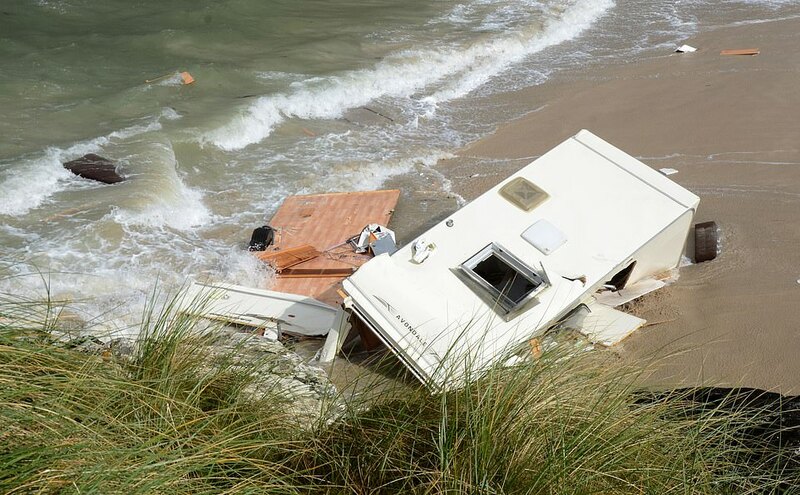 The caravan plunged up to 30ft onto the beach and later became submerged. Members of Clifden Fire Brigade, Gardai and the Cleggan Coast Guard were on the scene but could not save the woman. 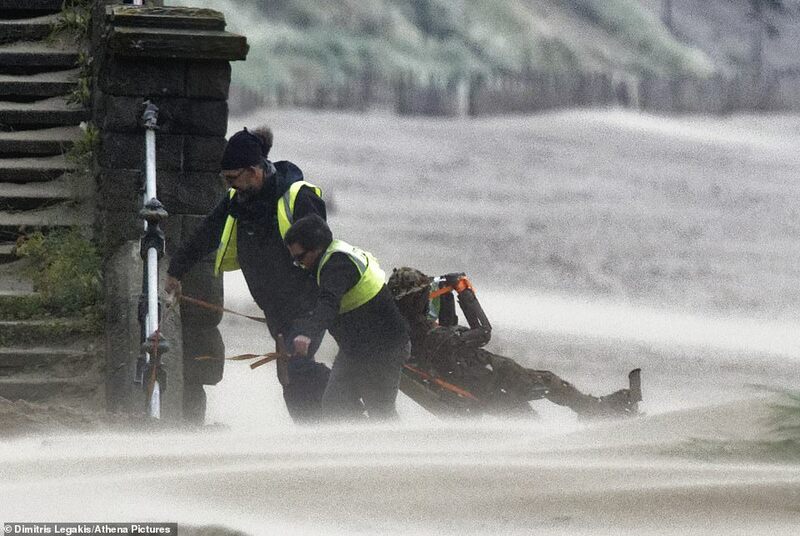 Her body was found on the beach and was taken to hospital for a post mortem examination. Speaking from Switzerland, her friend Rolf Weber said: 'I am deeply shocked. This is just so tragic. I saw her two days before she left for Ireland in August. She was excited about her trip. She was off to learn English. Her belongings, including a bike helmet, were strewn along the beach. Ms Ferrari was a health worker who had done studies into Alzheimer's disease. She lived in an apartment in Steinmaur, in the canton of Zurich. She departed for Ireland on August 26 for a five-week trip to attend an English language course and go travelling. President Michael D Higgins was among the first to offer his condolences to her family yesterday. The death shocked the remote area of Connemara where substantial damage was caused by Storm Ali to houses, trees and roads. More than 15,000 houses were without power in County Galway, with dozens of schools closed. News of the tragedy spread quickly throughout the area and Claddaghduff curate Fr Sean Smith said people were shocked and saddened. 'It is so tragic that a visitor to the community should lose her life in this way. I send my condolences to her family,' he said. Fr Smith said there was considerable damage caused in the locality by the storm. 'We had so much damage here throughout the area in the early hours of the morning, and it was definitely worse than Storm Ophelia last year,' he added. In the Highlands a man had to be rescued after becoming trapped under a digger in a river in Rogart. Storm Ali, which brought winds of 102.2mph on the Tay Road Bridge in Dundee, cleared the UK on Wednesday night. 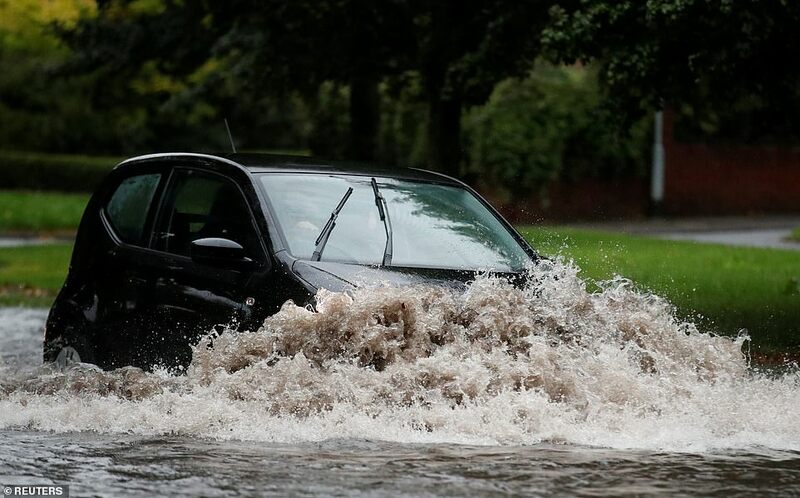 Up to 4in (100mm) of rain had been forecast to fall across high ground in Wales and Cumbria. The unsettled weather is due to last the rest of the week and is caused by a jet stream from Canada, the Met Office said.